I WILL SELL SOME PARTS OFF OF THE CAR CALL OR EMAIL WITH REQUESTS. DO NOT WASTE MY TIME OR YOURS WITH SPAM, GIMMICKS, OR GET RICH QUICK SCAMS. All-in all, this seems a pretty pedestrian Craigslist ad. The poster wrote it in a typical mix of all lower case with no punctuation and ALL CAPS FOR THE PARTS THAT HE OR SHE WANTS TO EMPHASIZE. One might find the incidental lower-case of "for the whole car" interesting, but it's clear that this seller creates many classified ads and includes that all-caps part in all of them but edited the bit about "for the whole car." The best part, well, the seller buried it in the middle of this ad where he or she lists the features of the car. Can you spot it? 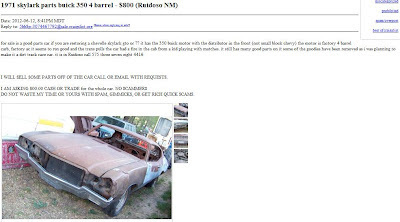 Let's see...350 Buick motor, four-barrel carburetor, factory air-conditioning...sounds good so far...the trans pulls...OK, I'm not really sure what that means, but that's nothing new on Craigslist..."the car had a fire in the cab from a kid playing with matches." Ah, there it is. The ad is oddly specific about the fire. Whereas most sellers would simply say "interior fire but mechanicals OK" or something along those lines, this Craigslister has assigned the blame but has cleverly left out any information about the kid. And that's a shame because we'd like to know more about the fire. Whose kid was it? Was it pesky neighborhood kids getting retribution because the seller (or previous owner) had taken their baseball? Is the seller's child Ralph Wiggum? Simply put, we love it when Craigslist ads create more questions than they answer. Movie Monday: It slices and it dices!